Hawaii's combination of ethnic cultures makes it a truly vibrant and fascinating place. Many of the islanders have held on to the traditions of their homelands, which they brought with them to the islands of Hawaii from diverse countries. In fact, a visit to Honolulu's Chinatown or a Japanese tea house may give you the feeling you've stepped into an Asian country. Also, over the years many of the state's immigrants intermarried with immigrants from other countries, as well as with native Hawaiians, creating a wonderful blend of heritage and culture. Hawaii is the only state to recognize two official languages: English and Hawaiian. The Hawaiian language is based on Tahitian dialect that was spoken by early settlers. The original language has changed slightly over the years, creating a unique Hawaiian language, yet many similarities still remain between the two. After the 1898 overthrow of the Hawaiian monarchy and subsequent suppression of native culture, the Hawaiian language almost became extinct. However, the revival of native Hawaiian culture has brought it back. Today, schools in the Aloha State teach children how to speak the Hawaiian language. Hawaiian immersion schools give students an even more in-depth education in the language. The most important Hawaiian words, aloha and mahalo, embody concepts signifying core Hawaiian values. 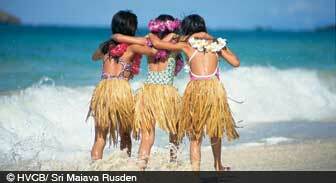 Many outsiders think of aloha as merely meaning "hello" or "goodbye." While the word is used in greeting and parting, it has deeper meaning of love, compassion, and affection. Mahalo means "thank you." Expressing gratitude has always been an integral part of Hawaiian culture, and mahalo encompasses that feeling. Because Hawaiians believe words have spiritual power, saying aloha and mahalo regularly can transform a person's life. A person should only say them when feeling the true spirit of the words, or their meaning will be cheapened. An unofficial language, Pidgin, evolved on the plantations as a way for immigrants that spoke different languages to communicate with each other more easily. Initially, they spoke a mostly Hawaiian Pidgin. As English replaced Hawaiian in schools and more children were born on the plantations, a new version evolved. It mixed Pidgin English, Hawaiian, and the children's own first languages, especially Portuguese. Eventually, Pidgin became the first language of many children born in Hawaii. Common Pidgin phrases include pau hana (finished with the day's work), talk story (chat), and brok da mout (tastes delicious). Early Hawaiians used simple methods to prepare foods, usually by boiling, broiling, or roasting. The sacred dish poi consisted of boiled taro root, pounded and mixed with water until it became smooth. Modern Hawaiians still enjoy poi. Another traditional dish called poke, a raw fish marinated in lemon or lime juice, is served with coconut cream, onions, seaweed, and sea salt. As foreigners came to Hawaii, they introduced foods like beef jerky and chicken teriyaki. Hawaiians embraced Spam more heartily than people in the mainland states, so travelers will find Spam dishes in restaurants and convenience stores. The luau is the cornerstone of Hawaiian celebrations. Early Hawaiians held these impressive feasts to commemorate important events and milestones. Graduations, weddings, and similar events still call for a luau. A signature luau dish is pork roasted in an imu, an oven made from a shallow pit dug in the ground. No luau would be complete without entertainment, such as hula dancers and Hawaiian music. Hawaiian music is best known for its use of the ukulele, slack key guitar, and steel guitar. The ukulele evolved from a small Portuguese guitar, the braguinha, brought by immigrants in the late 1800s. In slack key guitars, the instrument is re-tuned to a different chord by slackening the strings to create the characteristic lingering sound when played. Steel guitars achieve their signature sound by raising the strings off the fretboard, re-tuning the guitar, and playing it with a steel bar. Instead of being held in front of the body, they're placed flat in the lap. No discussion of Hawaiian culture would be complete without mentioning surfing. Ancient petroglyphs of surfers suggest that the sport may have originated in Polynesia and arrived on the islands with the first settlers. In Hawaii's olden days, everyone surfed – men and women; chiefs and commoners. Social status determined the length of a person's surfboard, as well as the type of wood used to make it. Hawaiians still love surfing, and the islands' excellent waves draw surfers from all over the world. Waimea's waves reach up to 25 feet high in the winter time, among the world's biggest swells. Numerous festivals throughout the islands reflect the many cultures making up Hawaii's population. This year, the state's Filipinos, Koreans, Portuguese, Japanese, and Chinese have all held events celebrating their heritage. Other festivals celebrate native Hawaiian crafts or traditions. The Hawaiians' love for their past monarchs has even inspired a festival, the Merrie Monarch Festival in honor of King Kalakaua. With Hawaii's laid-back character and unique cultural medley, it's a place unlike any other. Visiting this friendly, tropical paradise may fill you with the spirit of aloha. Mahalo! The distinctive history of Hawaii will appeal to many visitors.